Stephen Dorff graces the cover of issue 20 of VMAN. After a spell out of the limelight, the star who defined the smell of teen spirit in the 90’s is back, this time to star in the latest film by the next generation of Capolla –Sofia- to make a mark on American cinema. Mario Testino’s photos that suitably portray Mr Dorff in his new role as grown-up leading man accompany Derek Blasberg’s interview. Meanwhile, further from home, VMAN casts its gaze over the Scandnavian fashion scene in a special feature that includes articles on some of the leading lights of the region’s increasingly visible designers and a number of stories that elaborate the current Nordic fashion scene. Central to the affair is Mario Testino’s jaunt to Copenhagen with Candice Swannepoel. The South African model, best known for her foray’s into lingerie modelling for Victoria’s Secret, can’t help attract the boys’ attention and is snapped – in a nod to al those raunchy clichés about Scandinavian sexual mores- romping about it full colour. The location may be Scandinavian, but the fashion, styled by Andrew Richardson, is decidedly international: everything from McQueen to Balenciaga made it onto the flight. On the other hand, top local talent, in the form of artist Matias Faldbakken, gets roped in to do the artwork. And on a similarly arty tip, no one should ignore the collaboration between Hedi Slimane and American artist Collier Schorr who put their heads together to come up with a very particular vision of military masculinity. And so we began to scour once again. 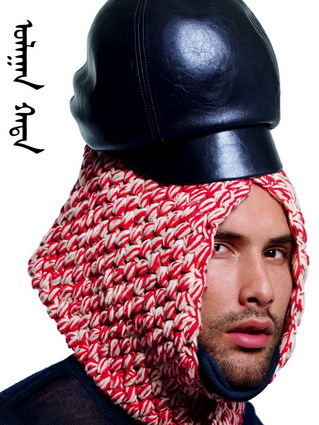 VMAN is the quarterly baby brother of V Magazine. 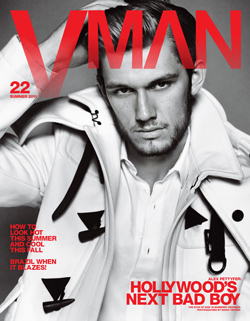 Born in 2003, to the same creative team responsible for its older sister, VMAN was a savvy move, responding to the hunger for a hip and stylish title aimed at a certain sector of American men. Sliding neatly into the gap between the rather conservative feel of established men’s fashion titles on one side and the boy-next-door jock antics of successful titles aimed at the younger market on the other, VMAN immediately gained a readership amongst aspirant and affluent urban males who were eager for an option that offered sophistication and a bit of luxury without these things being defined in boring traditional terms. 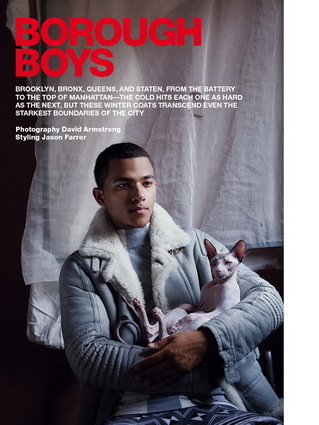 Retaining the breeziness and the bold styling moves of V Magazine, VMAN put a masculine twist on the formula, smartly realising that its target readership were not going to be put off by a less pedestrian approach to men’s fashion, indeed, quite the opposite. 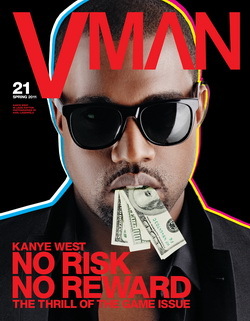 Staying true to a the mix of fashion, culture, music, celebrity and lifestyle, VMAN is particularly notable as an American title that operates from the position that its readership is educated and interested in the world outside. 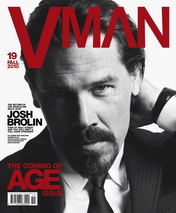 Somewhat unusually for a successful American title – given the traditional difficulties in attracting a popular American audience with content from outside its borders – VMAN is one of the few titles that manages to retain its strong roots in its native NYC whilst regularly offering its urbane readership international content. And, just like its older sister, its work with top photographers, stylists and personalities has made it a hit not only at home, but also abroad. There is a certain irony that one of the world’s largest economies actually offers relatively few stylish, upmarket and forward thinking magazines to its male population. But VMAN is almost certainly the top title in that small and special group.